Remember when we were a cigarette and two martini lunch culture? Round Top does. 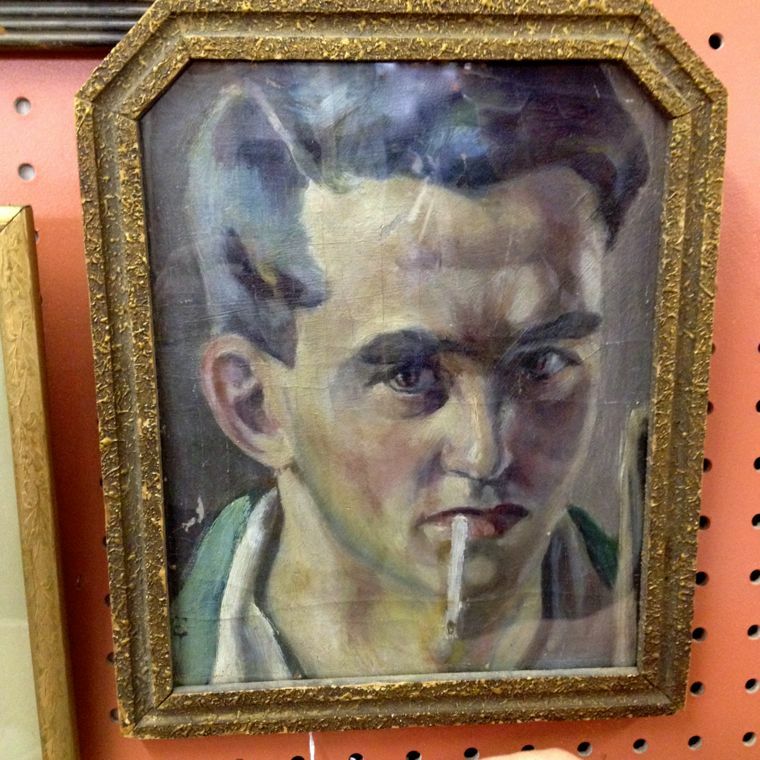 Antiquing is pretty much the same as museuming, except you get to buy the exhibits. 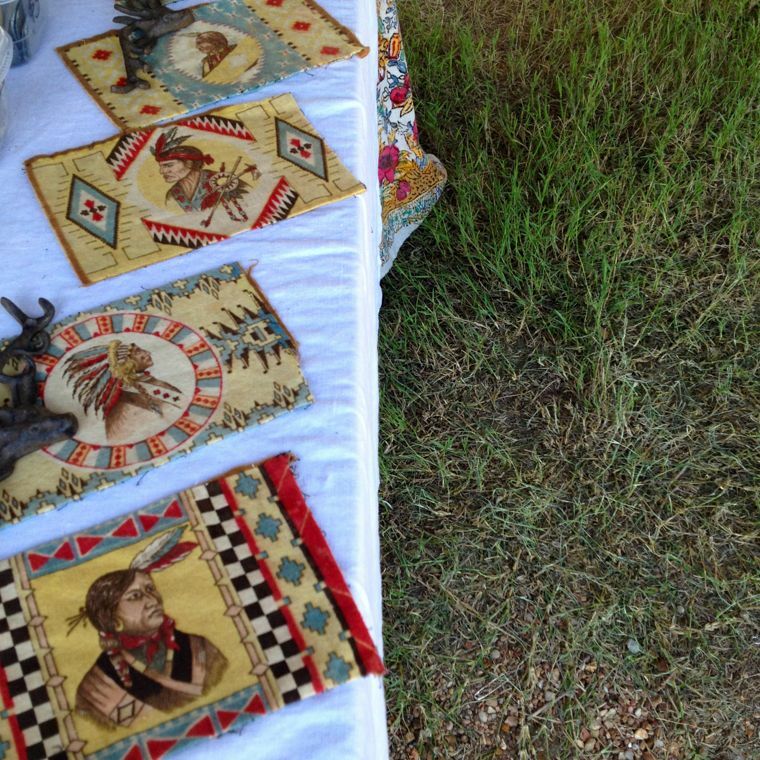 During my history walks through the fields and tents of Round Top I’m struck by the plethora of smoking memorabilia; tobacco silks and ashtrays and lighters and cigar boxes and pipes and such. It’s all a reminder of how successfully we’ve reduced the once stylish habit of smoking to a rather sorry process of dragging through the stick as quickly as possible while hunkered outside the service entrance in a stale winter coat trying to avoid small talk with Carl from Receivables. 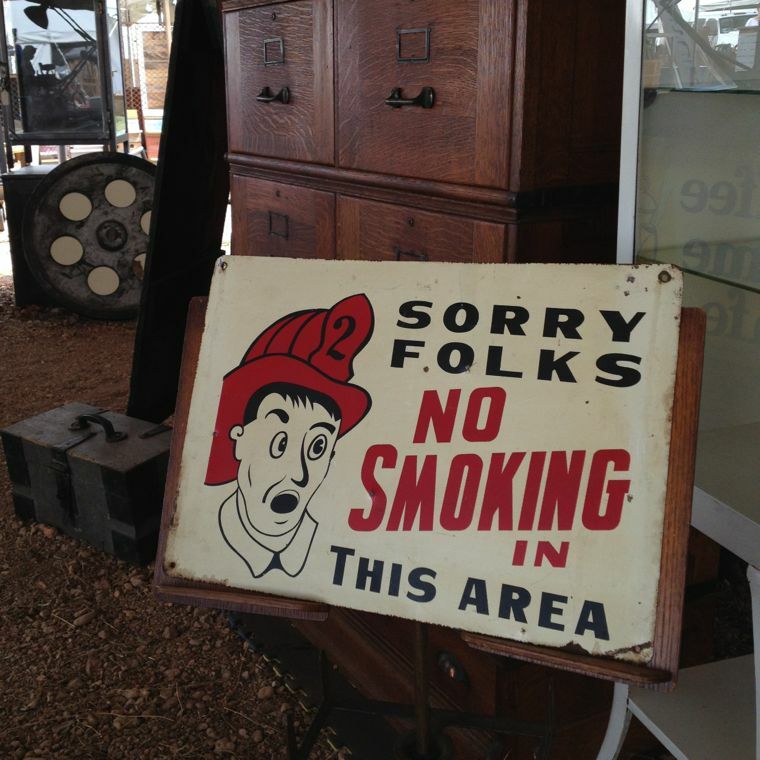 Heck, even our NO SMOKING signage has lost its mojo. And while we’re on the topic, may I say that I’ve driven through most of the United States and one thing I’ve observed is this: There are still a lot of smokers in the state of Oklahoma. Now it’s true that most of my time in OK has been spent on its interstate highways, and it very well may be that I haven’t been seeing a lot of smokers, just a lot of places to buy tax free cigarettes. So how ’bout a look at the actual numbers? 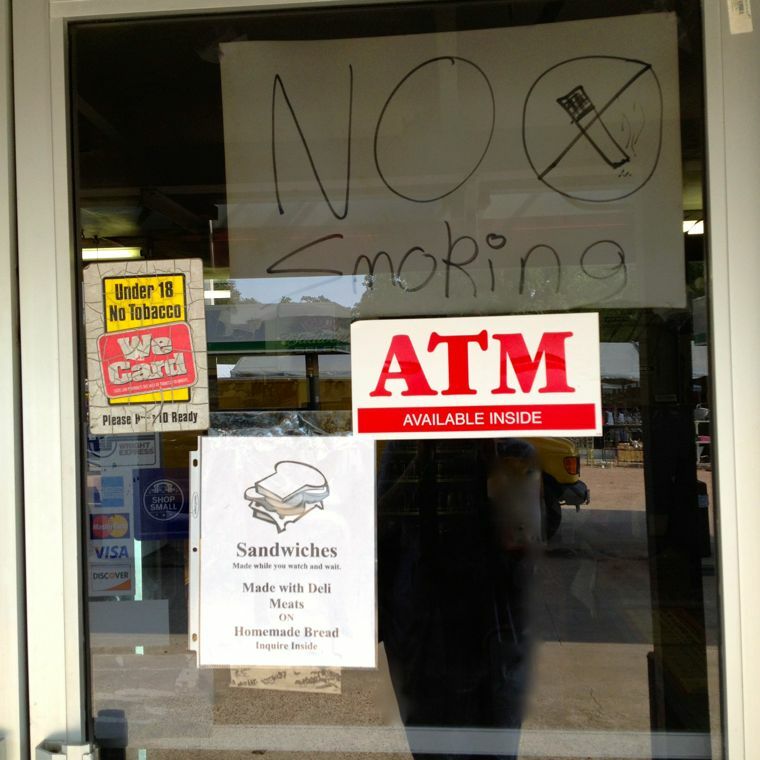 It turns out that there are a lot of smokers in OK (it comes in fourth behind KY, WV & MS). So I’m going to go further out on my limb and say that I bet it’s no coincidence that the National Lighter Museum was located right there in the town of Guthrie, OK. It looks to be a fun little stop… but heads up. I don’t see any updates on their website after 2008 so if you’re ready for that kind of museuming you should probably give them a call to make sure they’re still in business. Why call it your “Formal Living” when it can be your English Drawing Room? It’s time to leave our extrême adoration for Country French behind for a bref moment and hop aboard the Chunnel train. We’re off to the UK! Not really. But we are going to take a little photo tour of McLaren’s Buyer’s Market, the delightfully British antiques venue that brings a taste of the Jolly Old to lil’ ol’ Round Top. It’s a huge indoor/outdoor space right along 237 and I highly suggest you stop in for a bit of a nosy. Yes, those are well-priced Moroccan rugs in a canoe. Doesn’t get more British than that. And I don’t know about what’s happening in your town, but vintage Seiko ship’s clocks are all the rage in the hip decor stores here in Austin, TX. McLaren’s has so many to choose from you can select the one that feels exactly right for you, kind of like a trip to the animal shelter. In fact, everything’s like that here: Loads and loads and loads of choices. I’ve never met a Hoblin collector (as far as I know), but if you happen to be one, there are plenty of the little guys here for you. They claim to be “More than just a fairy story” and by looking at them I think that’s pretty darn obvious. For such creepy little things, they have rather jolly names: Pip, Pod, Puck, River, Spring, Spud and Twigg. It’s a list that may come in handy if you ever do find yourself at the animal adoption center. For some reason the Hoblins made me think of one of my all time favorite BBC Productions, Bleak House. It’s a classic that I hope you didn’t miss but if you did it would make for a perfect winter weekend bingewatch. Mr. Smallweed’s “Shake me up Judy!” is such a common phrase around our house that even the dog says it. Or I think that’s what he’s saying. And since we’re back to dogs, here’s a second list of names for your new pooch, all Bleak House characters: Lady Dedlock, Mr. Tulkinghorn, Inspector Bucket, Mr. Weevle, Mrs. Jellyby, Miss Flite, Mrs. Pardiggle, Mr. Turveydrop, Mr. Guppy and Guster (The Snagsby’s maid, given to having fits). The good news? You've discovered The Crush List. The not so good? I haven't been actively posting here for a few years now, which means the never terribly reliable details about my crushes are even more unreliable. Antique vendors have switched venues, shops in town have moved or passed on, donkeys may or may not be in the same front yards... In spite of the risks of massive misdirection I've left the site up in hopes that it still achieves its goal - to inspire you to visit Round Top for the Antiques Show or any time you have the time. With that said, I leave you to explore this random list of my very favorite things about my very favorite place I’ve tried to capture the area’s special pieces and parts. Some are big deal, some are small gestures, some are legendary and some are just tiny pip and squeak. Love The Crush List? Please Subscribe! You’ll get a weekly email with an extra image and a link to the new posts. Nice! Perhaps You’d Like to Read by Category? The Garden Co. Round Top NOW OPEN! Life’s Short! Wear Good Jewelry.